help you understand the emotions of the characters. That’s because in your images you’ll need to picture facial expressions and responses to other characters. 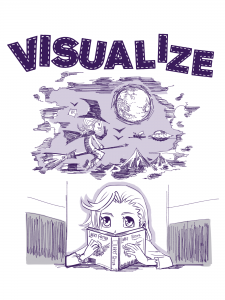 I’ve written more about how to visualize in this blog post. The more detailed you can make your visual images, the better. Think of yourself as creating the movie version of the book you are reading. What kinds of clothes are the characters wearing? What color are their homes and cars? Do they wink, nod, or cross their arms when they talk? The more you connect words to visual images, the more you will understand and remember the action. At the same time, you’ll develop your brain by creating a stronger neural network of brain cells and synapses. When you start to visualize, you’ll probably start to read more slowly. As I noted above, that’s good! It shows that you are starting to read at a deeper level.